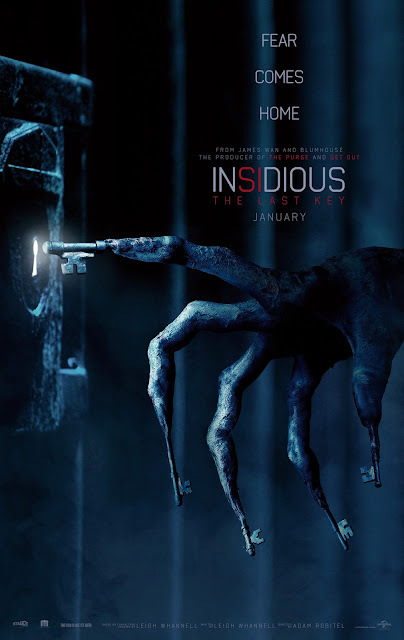 Reverend Guimo's Blog: My reflection on "Insidious: The Last Key"
My reflection on "Insidious: The Last Key"
I have to say, t he "Insidious" film series is a really surprising one. I never thought there would be a quadrology of films like this, and all of them are lots of fun. I've seen all four, and I've never been disappointed by them. The recent chapter in the franchise, "The Last Key" is a really interesting one, with a pretty great looking creature. It's not really about the monster though, as it's more an origin story for the lead heroine, Elise, and how her early life shaped her. It's more a family drama than anything else, and Elise has a lot to work out with her past. Some memorable scenes, some hokey stuff, but also a great cast and I can't stress how rad the "Key Man" is. For a more in depth review, check out the one by MovieBob. It leans towards some spoiler stuff, but he does a great job of breaking down the series.